This large and beautiful home, that we are about to explore, is the perfect place to raise a family. 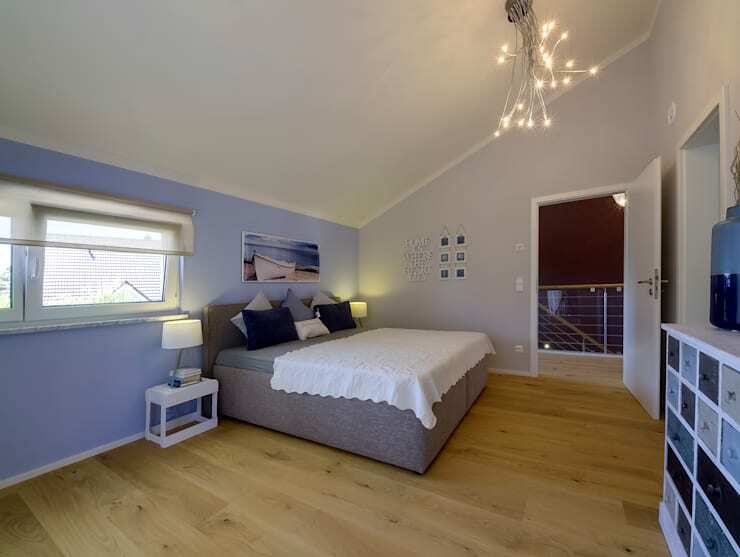 It is undoubtedly the home of a modern family, with a generous social area for pleasant moments, afternoons or even days of rest and recreation as well as comfort and interaction. Although purely holistic in its design, the house co-ordinates the spaces for each family member with a large domain for adults, which is separate to the smaller domain. 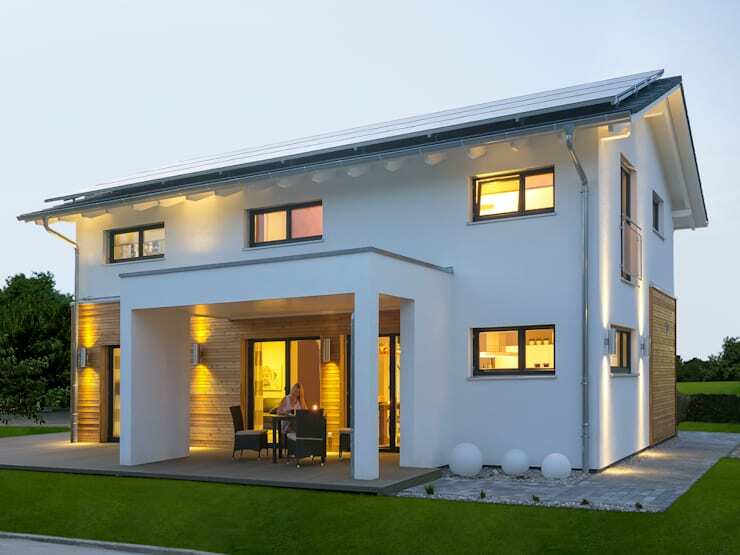 From architects Licht- Design Skapetze GmbH & CO . KG, today you are going to witness what a beautiful villa is all about! In the green surrounds of the idyllic area of Bavaria, we find this impressive family home. By combining traditional and modern architecture, the architects have created an interesting house, which stands out from the other, neighbouring homes. The most striking feature of the exterior facade is the presence of timber. Arranged horizontally, the wood integrates naturally into the design. Black and white also always makes a good combination and in this example, we can see how the black frame is enhanced by the white background. The ground floor living space is impressive, showing great respect to home furnishing. 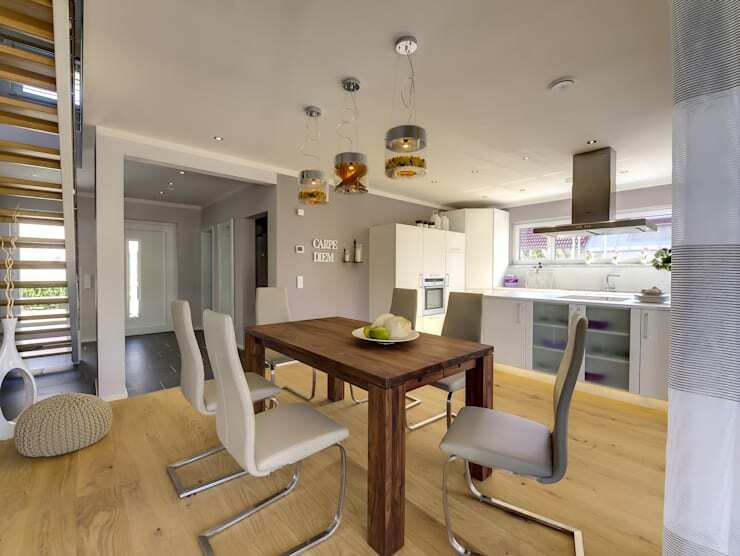 From this angle, we can see that the house has been designed open-plan, with the kitchen, the dining room and the living room concentrated in a single space. The core of this type of architecture is that the family or inhabitants can live a life that feels very free and fluid. There is a general feeling of comfort throughout the interior as well, thanks to the cushy furniture and colourful accessories. 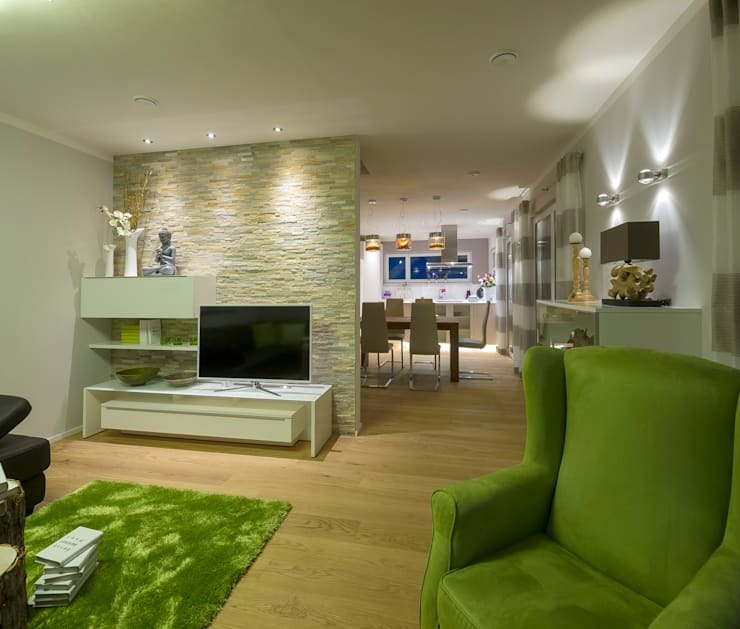 Green is used expressively and brings freshness to the environment. If you want your home to look like this 24/7, check out our: Slacker's guide to a quick home clean-up. In the dining room, a very intimate feeling prevails. The decor is simple and embraces various shapes and textures, while the colour palette is neutral and light. Every element comes together in perfect harmony. We love the mixture of styles with the traditional, wooden table and the more organic and modern dining room chairs. The retro and trendy hanging lamps are just the cherry on top! The kitchen is equipped with bright white cabinets and spacious counter tops. The choice of materials creates a modern atmosphere, but is still very warm and welcoming. 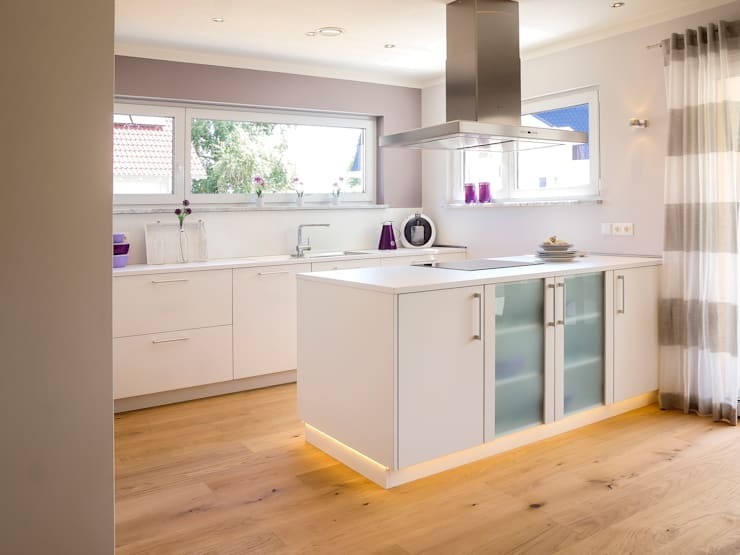 This is achieved by the warm colour of the wood, which contrasts with the coldness of the white cupboards. The appliances are also perfectly integrated into the design. Have a look at these homify kitchen products for ideas on how you can achieve a kitchen just like this! Elegant and luxurious, this bedroom has all of the characteristics that make it comfortable and inviting. The key in this room was to keep the neutral colour palette, but to intersperse it with shades of blue that evoke tranquility. Bedding and decor accessories are very important in the decor of a bedroom. The blanket, quilt and various pillows make this king size bed even more attractive! It's almost as big as the bedroom! The main bathroom has been decorated with high quality furniture and an impeccable eye for detail. The existing windows in the room also allow for a good flow of natural light while the modern sink that is suspended on the wall leaves more floors space, which looks lighter and more modern. Tip: Go for anti-slip floors in your bathroom, like these designers have done. This ensures your safety when you climb out of the bath or shower. 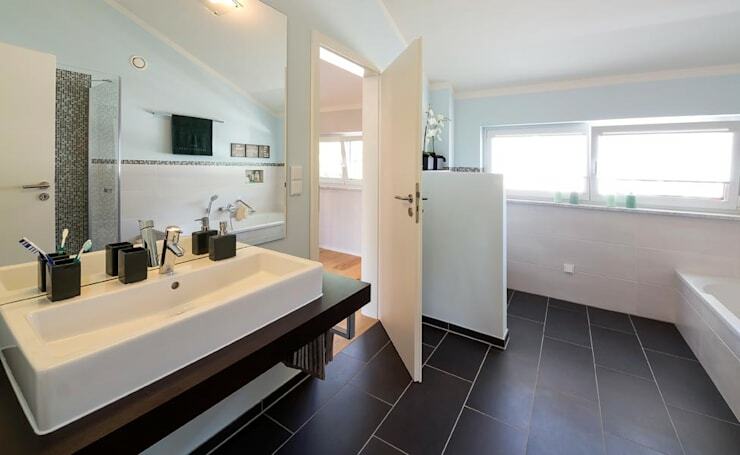 Have a look at this guide: Which floor for your bathroom? We end off this ideabook exploring the child's bedroom on the upstairs level, which is full of lively and cheerful tones. The colour pink brings tremendous energy to the child's room. While there is a playful side to the room, the designers have also included a desk area for homework and focus. You'll notice that the desk is a more neutral colour, which means that those who live in the home can make use of it long of the child has outgrown pink—a great tip! Everything about this home is creative, innovative and homely. It truly is the star of the block.